This book is a methodological primer on how historians gather evidence, presume reliability of witnesses, and develop forms of verification in the conduct of analysis and research. It is an introduction to the study of history and an examination of specific instances in which ideology has distorted the study of American history. Oscar Handlin is best known as America's leading historian of ethnicity and the immigrant experience in the new nation. When it was first published in 1961, The Distortion of America was perhaps the first critique of anti-Americanism as an ideological expression of Marxism-Leninism in schools of higher learning. 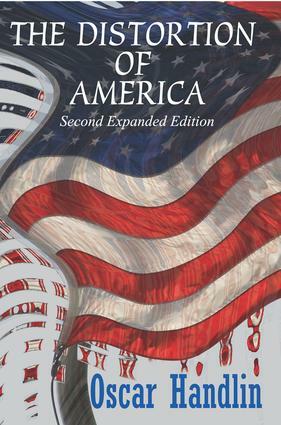 For the second edition, originally published in the 1990s, Handlin added chapters on forces affecting economic strength in the US; race and distortions of America; Yugoslavian troubles created by class divisions; and the relevance to China of democracy in the United States. The final chapter is a memorable essay on how Arthur Koestler's career exemplifies the difficulties of the ex-communist in an unsympathetic environment. Now available in paperback for the first time, this volume offers a new generation of historians and students an opportunity to acquaint themselves with one of the premier historians of the twentieth century.